This is a cross-shaped John Bull porcelain sign. This particular John Bull sign is orange with black and white text. 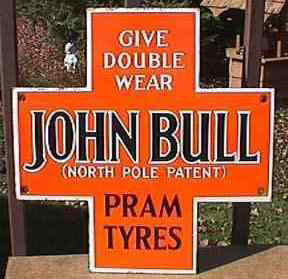 It reads, “Give Double Wear, John Bull (North Pole Patent) Pram Tyres” and features a thin white border.